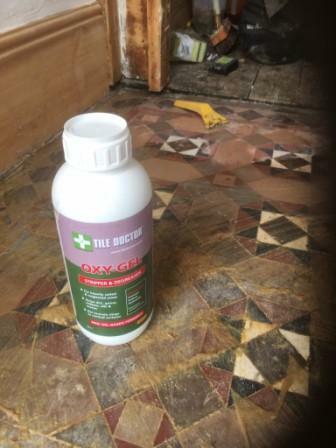 Tile Doctor Oxy-Gel is a Strong Alkaline Based Gel cleaner and degreaser, which works well on Vertical surfaces where a long dwell time is required to break down dirt, grime, Acrylic Sealer, Body Oil, Soap Scum, Mildew Stains and Oil Based Products and Waxes. Recommended for use on on Natural Stone (Granite, Marble, Limestone, Travertine), Porcelain , Ceramic, Terracotta and any other clay Type tiles and Masonry Surfaces. Wear Rubber Gloves and Eye Protection before using. Oxy-Gel is applied Neat to the surface to be treated with a soft paint brush, no agitation required at application stage. Allow to dwell 3 to 5 minutes for cleaning, or 5 to 10 minutes when stripping waxes or finishes from floors or other surfaces. Agitate With either a White Nylon pad or Hard brush < depending on Texture of Tiles > apply water as you required, rinse and clean until all the Oxy-Gel has been removed. Remove the soiled cleaning solution using a wet vacuum. Rinse thoroughly with clean water and remove with a wet vacuum. Several applications may be required to treat stubborn stains. PLEASE NOTE: It's important to remove any cleaning solution effectively using a wet-dry Vacuum before sealing; any cleaning solution left on the surface may impact the performance of the sealer. Approximately 3m² to 6m² per litre depending on texture and smoothness of tiles. Available in 1 litre bottles at £15 each and 5 litre bottles at £69 each, postage and Packing £5.50 for 1 litre, £10 for two or more litres (all prices are shown inclusive of VAT).